Who is the greatest manager? Alex Ferguson, with his 12 league titles, 9 cups and 2 Champions League Trophies during an unsurpassed two decades at Manchester United, or Jose Mourinho, who won 2 consecutive league titles, 3 cups and is one of only a few managers to prevent Manchester United from winning the title. This is an argument too contentious for any book to answer. 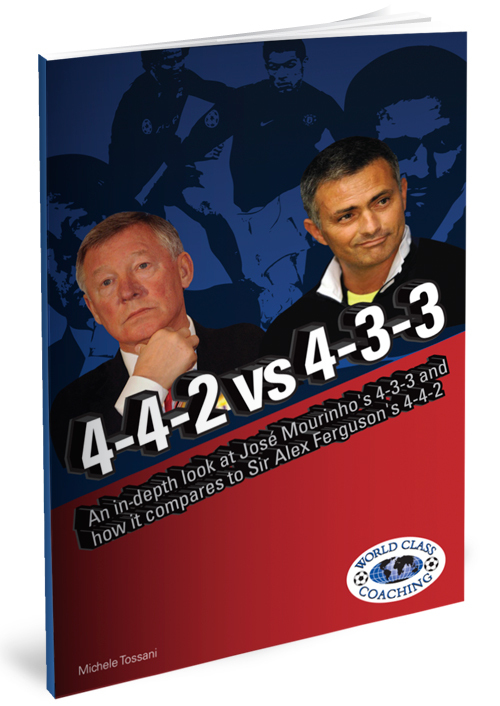 But what this special book, 4-4-2 vs 4-3-3, does do is to analysis in-depth the differing formations, strategies and tactics used by the two managers. Ferguson and Mourinho both shared a belief in building on a strong back four. After that, their tactical outlooks differed considerably. Mourinho’s favored 4-3-3 formation relied on using a playmaker as an offensive weapon, offensive wingers that would directly attack the box and a lone forward as a pivot to open space for oncoming players. Whereas Ferguson focused on a strategy that closed down opponents, attacks that started from the back and fullbacks that could overlap to give them a numerical advantage further up the field. 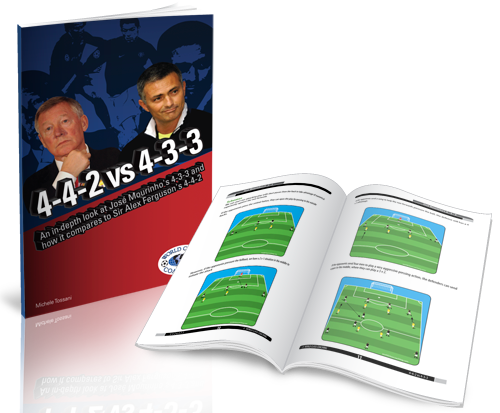 Through detailed diagrams and clear explanations, 4-4-2 vs 4-3-3 analyses in detail the characteristics of each managers’ formation and how each enabled them to dominate opponents. In addition, this unique book answers many key questions about their systems and tactics, such as did the players fit the system or the system fit players; how did Ferguson setup his team to successfully defeat Chelsea in the Champions League Final and how did Chelsea manage to score so frequently with only a single established forward. For both students of the game and expert coaches alike, 4-4-2 vs 4-3-3 is the definitive analysis of two of the playing styles of two of the Premier League’s great tactical wizards. Author of 4-4-2 v 4-3-3 Michele Tossani is a coach and student of the game. Tossani is the author of a number of books including A Coach’s Guide to the 4-3-3, Zonal Defending the Italian Way, Champion’s League Tactics, Modulo 4-3-2-1 and Analisi Tattica Champions 2002 – 2003. He has also written numerous articles for the popular Italian soccer web site www.allenatore.net. This book is organized into chapters that focus on the playing styles of Chelsea and Manchester United individually before pulling them together into a concluding chapter at the end. Through extensive detailed diagrams and clear explanations, 4-4-2 vs 4-3-3 provides a methodical analysis of these two great English Premier League sides. José Mourinho’s 4-3-3 – This chapter starts by looking at the advantages and disadvantages of playing 4-3-3, which is arguably one of the most popular formations in the top divisions of European soccer. It then examines how Mourinho’s Chelsea formation differed from a typical 4-3-3 and how it was effective against the 4-4-2 formation adopted by many Premier League sides. In particular, it discusses how you can use the superiority of a packed central midfield and how the greater numbers upfront can spread the defense, creating opportunities of your forwards. Sir Alex Ferguson’s 4 – 4 – 2 – The book’s title is a little disingenuous because Alex Ferguson has been known to switch to a 4-2-3-1 or 4-4-1-1 depending on the circumstances. 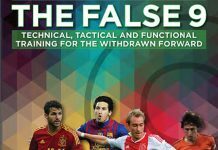 This chapter analyses how Ferguson’s formation utilized wings in the offence, the combinations between forwards and the use of fullbacks for quick counter attacks. In addition, this chapter assesses the special attributes of the 1999 team’s midfield of Roy Keane, Paul Scholes, Ryan Giggs and David Beckham, and then how the team was adapted to accommodate the talents of Christiano Ronaldo, Wayne Rooney and Carlos Tevez. Mourinho’s Key Chelsea Players – This section assesses the characteristics of key players under Mourinho’s reign at Chelsea and how they were utilized. This includes Petr Cech, Frank Lampard, John Terry and Didier Drogba. Ferguson’s Key Manchester Utd Players – Manchester United has never struggled to attract the world’s best players, and Ferguson has proven to be adept at combining big name signings with high quality home grown talent. Illustrious names on his team sheet over the years have included Edwin Van der Sar, Jaap Stam and David Beckham. 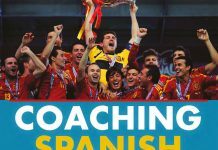 What We Can Learn From Mourinho and Ferguson – In his closing chapter, author Michele Tossani summarizes what coaches can learn from these two great managers, along with their tactical similarities and differences. How did each utilize the holding midfielder and what were their differing attitudes to wingers? Both these questions and many more are answered in this unique book. 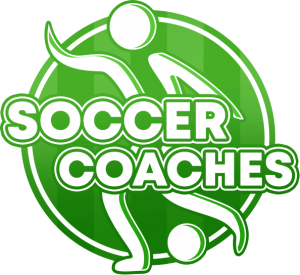 What better soccer coaching education than getting inside the mind of two of the game’s greatest tactical wizards? If you’ve ever wanted to coach your team on how to replicate the relentless ‘never give in’ mindset of Manchester United or the attacking flair of Chelsea, then this is the book for you. Through detailed diagrams and clear explanations, it shows you exactly how each manager utilizes their chosen formation to get the results they needed. Ultimately, your tactical nous and reading of the game will be enhanced by this unique book. 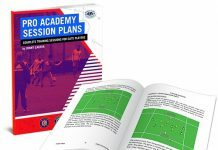 You will gain an enriched understanding of how two of the game’s greatest managers turn games in their favor through tactical changes, and how to apply their philosophies to your own team. “I really enjoyed reading the 4-4-2 vs. 4-3-3 by Michele Tossani. Mr. Tossani gives you an in-depth look at how to utilize the 4-4-2 vs. 4-3-3 in both offensive and defensive formations from two of the top coaches in the world and their tactical thinking. 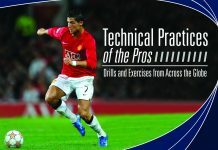 I highly recommend this book.” John Abe ex pro player and youth coach since 1987. If you’ve ever wondered what the secrets are behind Alex Ferguson and Jose Mourinho’s success, now you can find out through this in-depth study of their formations, tactics and philosophies. 4-4-2 vs 4-3-3 explains in detail everything you need to know about how they utilize their players to outwit opponents, to create more goal scoring opportunities and to get the results they need to win numerous league titles and cup tournaments. This special book’s detailed diagrams and explanations will enable you to understand exactly how their teams operate and will provide you with valuable insights you can apply to your own team’s tactics. Whether you are a student of the game or a coach playing at the highest level, 4-4-2 vs 4-3-3 is a unique analysis of two of the game’s greatest tactical wizards and a valuable addition to your coaching education.